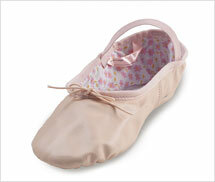 Home > BALLET SLIPPERS > "Capezio 205C ""Daisy"""
More Details - "Capezio 205C ""Daisy"""
Supple and durable leather. Practical and fun for every age dancer. Available in a shade of ballet pink that perfectly matches Capezioâ”¬Â« ballet pink tights. Daisy print, hung cotton lining. Satin ID tag. Drawstring secured at the back. Full suede sole. Elastics are pre-attached. Childrens sizes.